From preschool through high school, LEGO® Education provides a continuum of hands-on, playful learning solutions that engage every student’s natural curiosity. These solutions help students develop 21st century skills such as critical thinking and problem solving, while also encouraging them to become lifelong learners. Educators can easily integrate these LEGO Education solutions, designed with lesson plans aligned to national curriculum standards, into their existing curriculum today. LEGO Education solutions are a perfect tool for today’s educators who are looking to boost student engagement and STEAM curiosity, while also improving learning outcomes. 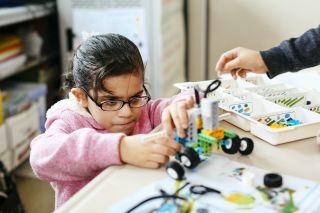 LEGO Education combines hands-on play with tangible STEAM lessons and curriculum in coding, robotics and other subjects, while also helping students develop tangible job-related skills that are critical for the 21st century. In addition to providing instant, hands-on engagement, LEGO Education solutions come with lesson plans that are aligned to national curriculum standards, which ensures that educators are achieving their curriculum goals as well. Moreover, educators get easy-to-follow lesson plans, online support, and the option to extend the learning with after-school programs, competitions, and more. There are three levels of the LEGO Education learning portfolio: Early Learning, Primary, and Secondary. Here’s a quick look at all three of them. LEGO Education solutions for early learning encourage young learners to explore the world around them as they collaborate and play with others. These solutions use play to introduce students to early math, science, and language skills. LEGO Education early learning solutions foster a love of discovery and investigation to help the youngest students develop social and emotional skills that set them up for a lifetime of successful learning. Coding Express, LEGO Education's newest early learning solution, introduces young learners to early STEAM and coding skills, while also building their confidence, collaboration and creativity skills. Coding Express uses a classic toy train set to teach children early coding concepts such as sequencing, looping and conditional coding. Students learn problem-solving skills, critical thinking, and collaboration, social and emotional skills, all while learning through play. As students continue their learning journey, LEGO Education solutions grow with them. LEGO Education solutions for primary school spark students' natural curiosity, helping them develop essential communication, creativity, collaboration, and critical thinking skills in an engaging, hands-on way. Tactile, flexible solutions grow with students as they problem-solve and discover how science, technology, engineering, and math affect their everyday lives. Take LEGO Education WeDo 2.0 for example, which includes LEGO bricks, sensors and motors, and block-based coding software. WeDo 2.0 offers primary students endless possibilities for making abstract STEAM concepts come to life in a tangible way. Designed with collaboration in mind, each set supports two students, introducing them to science, computational thinking, and engineering principles in a fun and engaging way. Continuing to support students as they grow, LEGO Education solutions for secondary school provide hands-on experiences that allow students to develop their scientific inquiry, engineering design, and data analysis skills. This allows secondary school students to succeed in their STEAM classes today and realize their full potential in the digital workplaces of tomorrow. With LEGO® MINDSTORMS® Education EV3, for example, students can build and code robots, learn about space, and expand their creative confidence with software and physical bricks. This solution helps students learn coding, critical thinking, and math and science skills to prepare them for the 21st century. The solution also comes with standards-aligned activities, and lesson plans to boost student engagement. When it comes to engaging your students in STEAM learning, LEGO Education has you covered every step of the way, providing you with solutions that grow with your students. Get your students hands on with the LEGO® Education learning portfolio today. Boston K-8 robotics teacher Huijing Wu talks about her positive experiences with LEGO Education solutions. Dr. Allison Pilley, Director of Learning Support with Springfield Public Schools, explains how LEGO Education WeDo 2.0 and LEGO® MINDSTORMS® Education EV3 are helping her schools teach STEM skills. Becky McDowell of Roslyn Road Elementary in Barrington, Illinois, discusses what LEGO Education WeDo 2.0 and LEGO® MINDSTORMS® Education EV3 are delivering to her students and school system.